With digital technologies, anyone with a basic knowledge of both fashion design and computing can create 3D images—still and animated—that realistically capture how fabrics will look and clothing will fit. Packed with tutorials and step-by-step instructions, this guide explores the far-reaching capabilities of 3D fashion software. 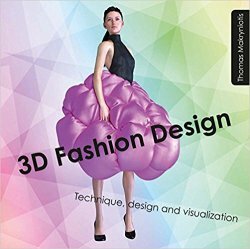 It begins with the principles of working in three directions, and moves on to creating the mannequin avatar, garments, accessories, and textures. Case studies and the various software programs are covered in detail.